Every day after Thanksgiving, for the past 104 years, my little home of Doylestown, PA holds a grand tree lighting and Santa arrival to mark the start of the Holiday Season. Thousands crowd the small borough streets to see the spectacle. Like a Norman Rockwell scene. I have become involved by providing social media video coverage. This year I really wanted to try to capture it in 360 with my six camera GoPro system. I found a street sign to mount it to on a long painter pole right next to the tree…..in the center of the action. The challenge was that I had to set it up, leave it alone for two hours……and hope for the best! At first I thought my external batteries weren’t going to work right. Despite my testing earlier in the week, one of the batts wasn’t staying on to power the cameras. And my remote was acting glitchy. I should mention it was also quite cold that day. So I decided to start them recording early, and hope for the best. The six camera GoPro HERO5 Session system mounted at the center of event action. My mounting spot worked out great–I was worried about people crowding around and touching the street pole, but it turned out to be a mostly off limits area for crowd. Fast forward to the end of event, and all six cameras were still running! As you can see from my desktop screen, a perfect stitch, and a great viewpoint! Before I was able to work on the 360 video, I needed to complete what was my main task of capturing the event with “traditional video.” For this, the 360 footage provided me with great views captured all at once, which I could edit into the main video by cropping whatever viewpoint I wanted to show. I was able to pan the crowd, for example. The clip below shows which scenes were actually from the 360 system. Hard to tell from a traditional “single view” video camera. With one camera system locked in one location, I created a video that appeared to have many more angles and viewpoints. I love the creativeness I have available during post. This is an application of 360 systems that I plan to explore more. One locked down camera system in the center of the event–choose your shots in post later. Back in my home office-I first transferred the videos from all six cameras using GoPro Quik. Then it was time to open up a project in Autopano Video (a real pity they are discontinuing this great software). Since I had several clips from each camera, all meant to be merged into a single 2hr long video, I merged them. Each of the six 2 hour vids- 48GB. I have realized that I want Santa to get me more disk space this year! After merging, I synched, then stitched into an equilateral projection (think of a globe that’s been unwrapped and flattened). Stitching went well. I had an obnoxious seam right in between a prominent street sign, that I could mask around using AutoPano’s masking tools. With a fixed camera, fairly easy to do. Mask once–entire scene done. Overall, I was pleased with the quality that was captured in difficult lighting conditions. Even though I have invented a 360 lighting device, it wasn’t going to be able to light the entire street! Once I was ready to render out of Autopano, I wanted to maintain the highest output I could. So I rendered the 8Kish file (7858×3929) as ProRes LT. I split the render into three vids to make it somewhat less unruly. Still, each rendered 8K was about 480GB! Now time for actual editing, via Final Cut Pro X, which has been doing very well implementing full 360 video editing. 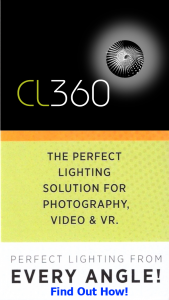 As I have been working on these projects, I think I’ve started to develop “my look and feel” for 360. I like the look at embedding titles as part of the scene, and not just as an overlay. I used this technique for the video’s own title, which is a constant element on an old store sign prominent in the camera view (was a Starbucks logo). Replacing a business sign with the title of the event. In the case of featuring what was a live public event, I condensed it, but in what was still long segments. The viewer, whether via screen or headset, needs time to orient to what is being presented…to look around. So when the town Mayor gave the introduction, I showed his entire speech without editing. Jump cutting speech I don’t think works well in this medium. Neither does fast changing scenes. Between each of my scenes is extra padding-a few extra seconds before the choir starts singing, for example. I like to let the viewer have enough time to figure out where they want to look at before they need to pay attention to the content. I think this worked well here. You may be wondering about the audio. It is a mix of the audio from one of the Session cameras, with audio recorded directly from the sound crew onto an iPad, and synched manually. Once editing was complete, time to render! Since I had constant graphic elements and a detail sharpen filter, this would take a while. Like about 14 hours! Producing 360 content seems to be about 90% rendering! The end results are well worth it, especially as 8K playback gets more commonplace. I’m pleased to present my town’s annual tradition to a new VR audience. The finished video below, up to 4K quality. If your hardware is capable, you can stream the full 8K resolution on YouTube. And I can’t forget about my sales pitch. If you have a need for 360 photography/video of a live event, real estate or travel showcase, documentary, etc. I am available in the Greater Philadelphia region. Contact me through this site, and follow me on the social media links!